Originally from Illinois, Ryan moved to Myrtle Beach to follow his passion for sales. After excelling in the auto industry for over four years, he decided to take another step in following his long-time goal of getting his real estate license. Growing up in a small town, Ryan learned a lot of his core values from his mother who was highly respected in the medical industry for always putting her patients’ needs above her own. While attending college in Indianapolis he realized that if he put those core values of integrity, diligence, accountability, perseverance and discipline to use, he would become successful. After moving to Myrtle Beach, he became one of the top producers and award winners for General Motors and his local dealership. 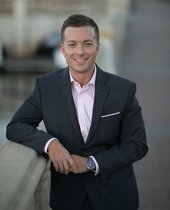 Now he’s fulfilling his dream of becoming a top producing realtor and applying the same core values to help clients find their dream homes along the coast. As a young professional, Ryan uses innovative technology and his passion for selling to reach customers and produce for them at a high level. He believes being an expert of Myrtle Beach and surrounding areas is a very important key to helping you find the right home. He also knows taking a step back and relaxing is important so when he isn’t working hard to find the right home for clients, you can usually find him on the golf course, a boat or the beach. He also enjoys watching sports, following the stock market closely, traveling and spending time with his family. When you’re ready to find your new home at the beach, call Ryan!